Siderite is named for the Greek word for iron, sideros. The word siderite is used in a number of rarer minerals and except in the fact that they all contain iron, they are otherwise unrelated to siderite. They include: Alumopharmacosiderite, arseniosiderite, barium-alumopharmacosiderite, barium-pharmacosiderite, chalcosiderite, erythrosiderite, pharmacosiderite, phosphosiderite and sodiumpharmacosiderite. A variety of siderite forming sphericules is known as sphaerosiderite. Siderite forms a series with the closely related minerals rhodochrosite, MnCO3 and magnesite, MgCO3. These minerals can have some substitution of their metal ions and the cutoff between them and siderite is at 50% iron. Sometimes variety names are given to intermediate members of these minerals such as mangansiderite for an iron rich rhodochrosite or magniosiderite for a magnesium rich siderite. But this can be confusing. Siderite is roughly the equivalent of calcite but with iron replacing the calcium. The iron has little effect on most structural properties such as cleavage and crystal form; but does effect properties such as density, color, hardness and electro-chemical properties. Siderite is fairly easy to distinguish from calcite by its higher specific gravity and hardness and less vigorous reaction to acids. It can be difficult to distinguish from dolomite however. Siderite and calcite can form similar crystal habits, although siderite is far less diverse. The typical habit for siderite is the rhombohedron. Most of the time crystals are found in the standard rhomb shape but noticeably flattened rhombs and rhombs with curved surfaces are also well known. Other typical habits include the scalahedron, crusts, sphericules, concretions and complicated botyroidal masses. Siderite forms mostly in sedimentary and hydrothermal environments, although it is also found in some igneous pegmatites. Siderite is a common mineral although excellent, attractive crystal specimens are sometimes hard to find. But many crystals, when colorfully iridescent, make a wonderful, colorful, satiny, shimmering mineral specimen. The iridescence is probably caused by a surface alteration to the iron oxide, goethite. Further alteration of siderite crystals can result in pseudomorphs. The amorphous iron oxide limonite, forms pseudomorphs that are complete replacements of siderite crystals. Siderite can be a nice collection mineral. It comes in just enough of a variety of crystal forms and colors that make collecting this mineral very interesting. SIDERITE Chemistry: FeCO3, Iron Carbonate. Class: Carbonate. Group: Calcite. Uses: A minor ore of iron and as mineral specimens. Physical caracteristics : Color is gray, yellow, yellowish brown, greenish-brown, reddish brown and brown. Some specimens show an iridescence probably caused by surface alteration to goethite. Luster is vitreous to pearly or silky in some specimens. Transparency: Crystals are usually translucent or virtually opaque. Crystal System is trigonal; bar 3 2/m. Crystal Habits are commonly curved rhombohedrons that are sometimes flattened to appear bladed, rarely scalahedral. Many aggregate forms are also found such as botryoidal, sphericules (sphaerosiderite), concretionary, stalactitic, vein-filling and earthy. Cleavage is perfect in 3 directions forming rhombs. Fracture is conchoidal to uneven. Hardness is fairly variable going from 3.5 - 4.5. Specific Gravity is 3.9+ (relatively heavy) Streak is white. Other Characteristics: Becomes magnetic when heated, effervesces slightly in contact with strong acids or with warm acids. Associated Minerals include iron sulfides and quartz, cerussite, ankerite, dolomite, goethite, cryolite, limonite, barite, pyrite and sphalerite. Best Field Indicators are crystal habit, slight reaction to acids, cleavage, color and higher than average density. A minor ore of iron and as mineral specimens. Siderite is a mineral composed of iron(II) carbonate (FeCO3). It takes its name from the Greek word σίδηρος sideros, “iron”. It is a valuable iron mineral, since it is 48% iron and contains no sulfur or phosphorus. Both magnesium and manganese commonly substitute for the iron. 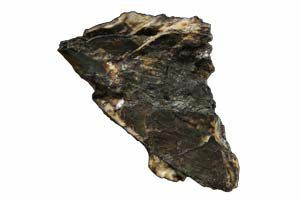 Siderite has Mohs hardness of 3.75-4.25, a specific gravity of 3.96, a white streak and a vitreous lustre or pearly luster.